She is called "Misteri with apple"
I liked how the 3d apple turned out. I inked with chalk ink and embossed the cream cardstock - folder is cuttlebug swiss embossing folder. The button is a clear button embossed with buttercup zing embossing powder. Pam this is a cute card. 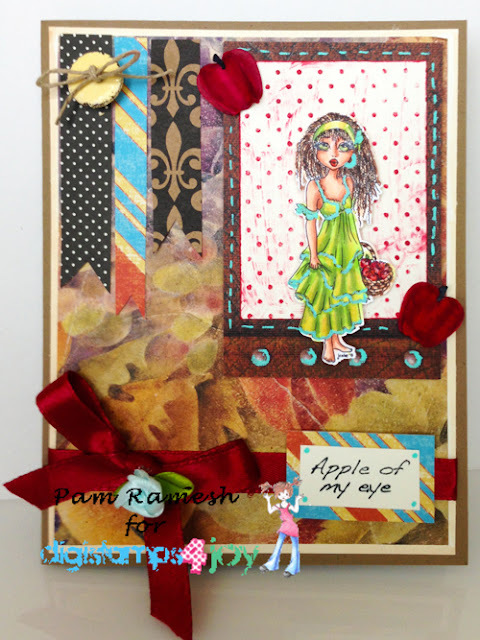 I love your coloring and all the different details you added to this one.. this card really stands out and I like the 3D effect of the apple. Absolutely gorgeous. So love the colouring and textures on this one. Very pretty. Love the details you have put in your card. A very pretty card. I like all your layers. Thanks for joining us at Chalk N Stock. Pretty card!!! Thanks for participating in our My Heart Pieces challenge!! Hope to see you again next week!